HeartMath® is a scientifically validated system of techniques and technologies that will help you to transform your stress, build your resilience and boost your performance. Self-regulation is the ability to monitor and control our own behavior, emotions, or thoughts, altering them in accordance with the demands of the situation. HeartMath South Africa is dedicated to improving health, performance and well-being at home and in the workplace. Our mission is to uplift and transform the hearts and lives of South Africans through learning simple emotional self-regulation techniques which ultimately build and sustain resilience. We provide products, training and consulting services that build happy and resilient individuals, teams and organisations. HeartMath was founded by Doc Childre in 1991 to help people bring their physical, mental and emotional systems into balanced alignment – a state often referred to as “The Zone”, or Coherence. The Institute of HeartMath’s research has shown that generating sustained positive emotions facilitates a body-wide shift to a specific, scientifically measurable state. This state is termed psychophysiological coherence, because it is characterized by increased order and harmony in both our psychological (mental and emotional) and physiological (bodily) processes. Psychophysiological coherence is the state of optimal function. Research shows when we activate this state, our physiological systems function more efficiently, we experience greater emotional stability, and we also have increased mental clarity and improved cognitive function. Simply stated, our body and brain work better, we feel better, and we perform better. 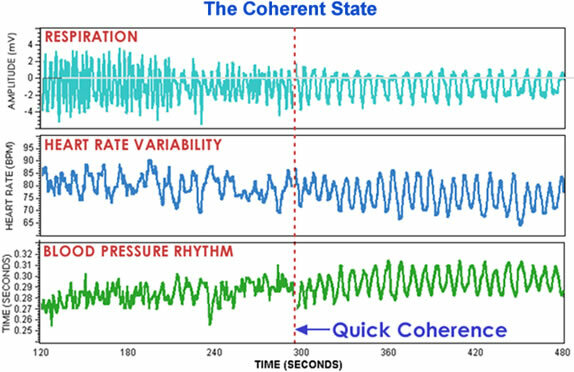 Physiologically, the coherence state is marked by the development of a smooth, sine-wavelike pattern in the heart-rate variability (HRV) trace. This characteristic pattern, called heart rhythm coherence, is the primary indicator of the psychophysiological coherence state, and is what the emWave technology measures and quantifies. A number of important physiological changes occur during coherence. The two branches of the Autonomic Nervous System (ANS) synchronise with one another, and there is an overall shift in autonomic balance towards increased parasympathetic activity. There is also increased physiological entrainment – a number of different bodily systems synchronise to the rhythm generated by the heart (see image above). Finally, there is increased synchronisation between the activity of the heart and brain. Coherence is not relaxation. An important point is that the state of coherence is both psychologically and physiologically distinct from the state achieved through most techniques for relaxation. At the physiological level, relaxation is characterised by an overall reduction in autonomic outflow (resulting in lower HRV) and a shift in ANS balance towards increased parasympathetic activity. 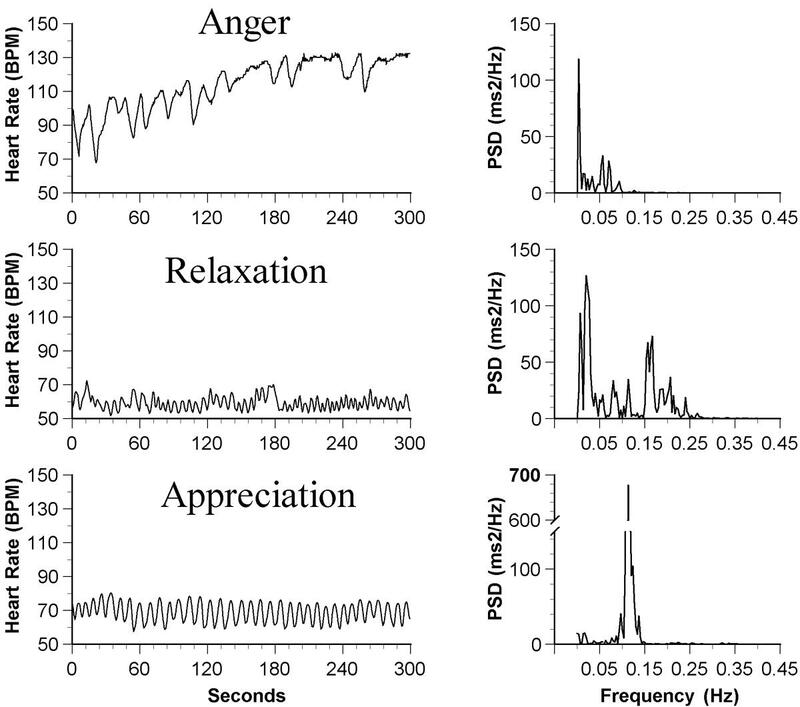 Coherence is also associated with a relative increase in parasympathetic activity, thus encompassing a key element of the relaxation response, but is physiologically distinct from relaxation in that the system oscillates at its natural resonant frequency and there is increased harmony and synchronisation in nervous system and heart-brain dynamics. This important difference between the two states is reflected most clearly in their respective HRV power spectra (see image to the left). 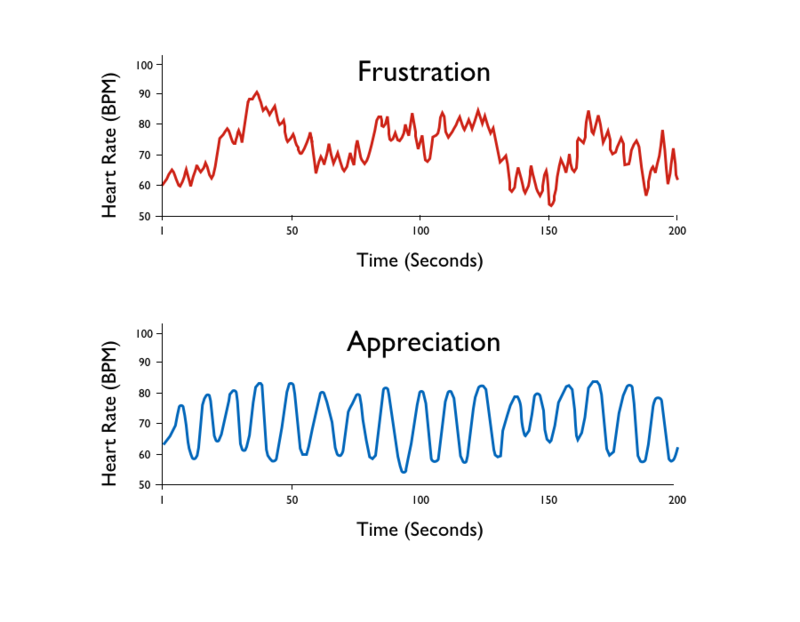 Furthermore, unlike relaxation, the coherence state does not necessarily involve a lowering of heart rate, or a change in the amount of HRV, but rather is primarily marked by a change in the heart rhythm pattern. Most of us have been taught in school that the heart is constantly responding to “orders” sent by the brain in the form of neural signals. However, it is not commonly known that the heart actually sends more signals to the brain than the brain sends to the heart through the vagus nerve. Moreover, these heart signals have a significant effect on brain function – influencing emotional processing as well as higher cognitive faculties such as attention, perception, memory, and problem-solving. In other words, not only does the heart respond to the brain, but the brain continuously responds to the heart. These effects of heart activity on brain function has been researched extensively and independently over about the past 40 years. 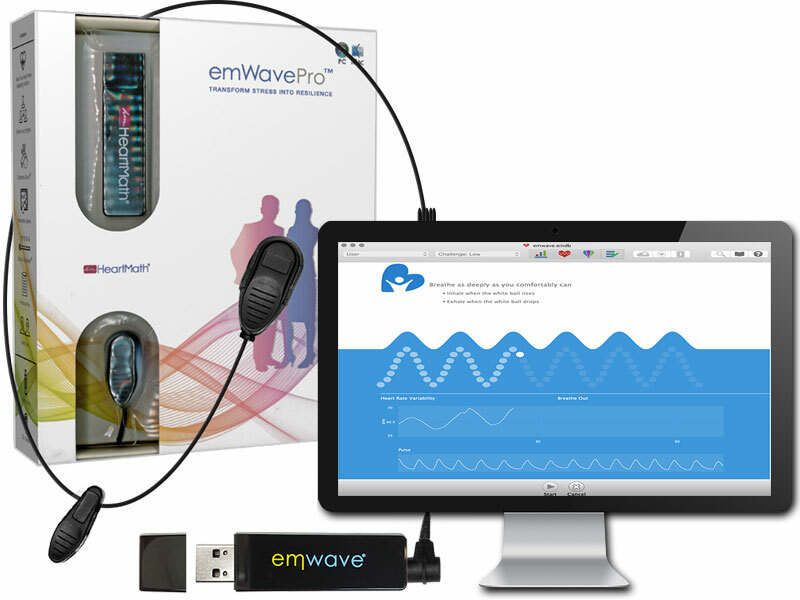 How do I use emWave Pro Plus to Measure HRV?